Planning Applications reference 7/2018/3087 and 7/2018/3088 to the Lake District National Park Authority relate to the insertion of "multiplate arches" under existing bridges over the Keswick to penrith railway trackbed. The bridges would also be infilled with concrete to support the bridge decks which are weak after some 150 years use. The method chose would block the route to trains in the future. Please write to the LDNPA objecting to these applications. Every individual objection counts ! Government Planning Inspector rules against blockage of the line by "infilling" a bridge at Highgate (between Troutbeck and Threlkeld). The Inspector upheld the Lake District National Park Authority's refusal to grant planning permission. The National Park's published written policy to protect the route was a key factor in this decision. A news item from the Lake District National Park Authority (LDNPA) gave the impression that the eight girder bridges over the River Greta between Keswick and Threlkeld were being removed and replaced by footbridges. That would have been a disaster for the Railway Re-opening Project, adding many millions of pounds to the cost. Such action would also have been against the LDNPA's policies to protect the route. In fact, the LDNPA was installing new decks on the existing bridges, specially designed for walkers, cyclist and wheelchair users. The programme of work was announced in the summer of 2012 and includes valuable skills training for apprentices. The new decking will help protect the main structure of the bridges from the worst effects of the weather and is therefore to be welcomed. CKP Railways plc has asked the LDNPA to urgently issue a correction, as their badly worded article has created a panic and generated bad publicity for them. Many people have contacted CKP Railways plc worried about this news. A big thank you to everybody for being vigilant and contacting us in such a timely manner - within hours of the item's release by the LDNPA. Unfortunately the misleading story has been reproduced on many media, history and railway websites, in newspapers and quoted by radio stations. Click here to read the article on "Cumbria Crack"
In January 2013, the Lake District National Park Authority (LDNPA) applied for permission to expand its depot at Threlkeld station. Plans as submitted would have damaged the Railway trackbed and the platform area. CKP Railways plc objected on the basis that this contravenes the LDNPA's own policies to protect the Railway trackbed. Many other people also submitted objections to anything which would interfere with the Railway re-opening or use of the footpath through the site. In early March 2013, after many objections were received, the application was approved with conditions intended to protect the Railway trackbed. In November 2012, British Railways Board (Residuary) Ltd., through its agents, applied to the Lake District National Park Authority (LDNPA) for permission to "infill" Bridge 91 at Highgate (between Troutbeck and Threlkeld). LDNPA Core Policies adopted in 2010 "protect" the Railway trackbed. 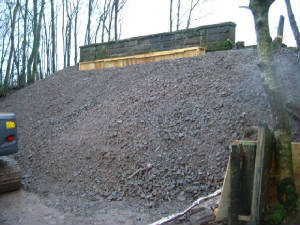 CKP Railways plc objected on the grounds that this work would physically block the trackbed and add major costs to the Railway re-opening. The application did not state what repairs the bridge needs. In January 2013, the LDNPA advised that it had rejected the application because it contravened policies to protect the Railway trackbed - and that the applicant had been advised of the policy position before submitting it. A bridge over a railway trackbed being "infilled"
Planning Application received by the Lake District National Park Authority (LDNPA) which would affect the trackbed at Troutbeck. CKP Railways plc has sent an objection. The LDNPA has recently pledged to protect the Railway trackbed (see Update 43). LDNPA advised in December that this planning application had been withdrawn. It was later resubmitted, but the LDNPA advised that negotiations would be held with the applicants regarding future provision for the reinstatement of the Railway. No urgent notices July to October 2009. Update No. 43 distributed early September 2009. ANOTHER THREAT TO THE TRACKBED AT FLUSCO. Despite receiving more than 60 objections, Eden District Council's Planning Committee granted Planning Permission for an industrial unit on the alignment of the Railway at Flusco. The application was made public in April 2009 and the decision was made on Thursday 16th July 2009. Officers recommended that Planning Permission for the Industrial Unit be granted and did not recommend any conditions regarding protection of the Railway trackbed - even though the Council has such policies. No Urgent Notices June 2008 to March 2009. Planning Application to extend an agricultural shed at Cocklakes. Application number 7/2008/3025 appeared on the Lake District National Park Authority's (LDNPA) list for the week ending 12th April 2008 (published at the end of April). This is a proposal to extend a shed for which permission was granted in November 2007. The location is adjacent to the Railway trackbed at Cocklakes, between Troutbeck and Penruddock, south of the A66. The plans, as submitted, were ambiguous - and could damage the Railway trackbed. The LDNPA formally wrote to CKP Railways plc on the 28th of April 2008, asking for comments. The LDNPA requested comments by the 14th of May. A planning application for a warehouse on the North Lakes Industrial Park at Flusco was shown on the Eden District Council list of planning applications received up to 29th November 2007. Eden District Council granted full approval on the 15th of January 2008, on condition that the development is carried out in accordance with the proposals submitted. The application as submitted does NOT affect the Keswick to Penrith Railway trackbed alignment. CKP Railways plc commented that consultation will be required if the site is changed or any associated activities could affect the trackbed. when your support is needed. Please check regularly - planning applications are published on a weekly basis and we often need to react very quickly !